Dust with some cocoa powder on top to give it a finish. Place the berries in a pan with 40g of sugar and the juice of one lemon and cook for 5 minutes or until the berries become softened (compote). In the meantime, pour the remainder of the caster sugar and water into a small saucepan and bring to the boil. Continue to boil until it reaches the softball stage; this is when you drop a little of the boiling sugar into cold water and it sticks together in a little ball. Use a teaspoon to pour in the sugar but be careful. Beat the egg yolks in the electric mixer and whip for 4–5 minutes until very pale and creamy. Reduce to a low speed and slowly pour in the boiling sugar mixture. Allow the mixture to beat for a further 8–10 minutes or until the mixture has cooled down completely. Continuing to use the electric mixer, whisk in the mascarpone cheese into the egg mixture. Remove the mixer and gently fold in the whipped cream. Select a shallow serving dish or glasses. Mix the coffee and marsala together and dip the biscuits into the coffee mixture one by one and arrange half of them flat in the serving dish. Spread some of the berry compote plus half of the creamy mixture on top of the biscuits. Repeat with another layer of biscuits and another layer of berries and cream mixture. Smooth the top of the cream mixture with a warm palette knife. 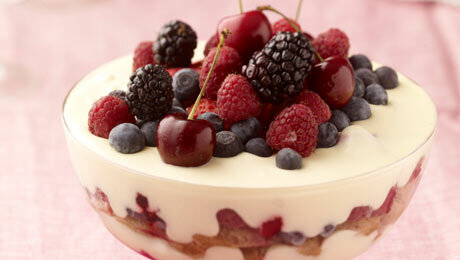 Decorate with some fresh berries. Transfer to the fridge for 2–3 hours to cool down completely.